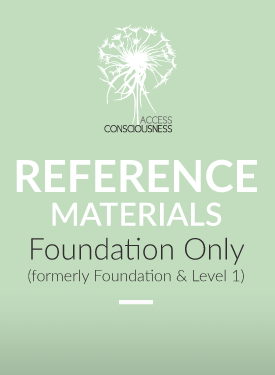 Reference Materials from The Foundation (formerly Foundation & Level 1) only. If you would like to purchase The Complete Set of Reference Materials that include both Part 1 The Foundation and Part 2 Choice of Possibilities click here. The Reference Materials are an incredible dive into a wealth of information that can change your life. Access Consciousness® classes have been facilitated for over 25 years and new material is constantly being created. The information and material for these classes is created from Gary Douglas and Dr. Dain Heer, the co-creators of Access Consciousness, and all of the participants in the classes around the world. Each year the manuals for the core classes, The Foundation (formerly Foundation & Level 1) and Choice of Possibilities (formerly Level 2&3), are re-written to include the newest, most relevant and life-changing material. At this pace, the manuals would be thousands of pages each by now! Therefore, to create more ease, much of the past information is kept in what are known as the reference materials. As you read through the materials you can see the threads of the even the newest material developing. It is an incredible dive into a wealth of information that can change your life. And don't be mistaken, even though some of this information is older, much of it can still be 'the item' for you or someone that you know or work with. Having access to, and an awareness of this material, is invaluable for creating beyond this reality! To purchase the complete set, CLICK HERE.